Find great adventure holidays and activities in Koh Samui and nearby islands here. KOH SAMUI is the third big island in Thailand located in the Gulf of Thailand with the area of 227 square kilometers. From north to south is 25 kms and east to west is 21 kms long. 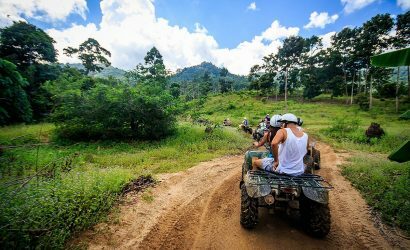 In the middle part of Koh Samui all are mountain area of jungle and some agriculture of durian, rambutan, mangoesteen and rubber plantations. Around Koh Samui are some nice beaches such as Chaweng Beach, Lamai Beachm Bophut Beach, Maenam Beach, Bang Por Beach, Lipa Noi Beach, Taling Ngam Beach, etc. You can come to visit Koh Samui all around the year. But during November to December it is quite heavy rains. The average temperature all around the year is during 27- 33 degree celsius. In April is quite hot that reach nearly 40 degree. However, if you don't mind a lot of rain or very hot in sometimes, you can come to Samui any time of the year!!! To get to Koh Samui you can take the flight with Bangkok Airways from Bangnkok, Chiang Mai, Krabi, Phuket, Utapao, and international flight from Hong Kong, Singapore and Kualalumpur. Some tourists take the flight from Bangkok (Don Muang Airport) to Suratthani with some low cost airlines such as Air Asia, Nok Air, Lion Air, then take the bus and ferry to Koh Samui, but takes about 4-5 hours more than the direct flight with Bangkok Airways. By train from Bangkok also possible, start from Hualampong Station and take any southern line train to Suratthani station (takes about 8 hours long) then take the bus from Suratthani town to Donsak Pier and cross to Koh Samui by ferry, this is the cheapest way to come to Koh Samui, it takes quite long time but also worth to do because you will have a chance to touch the real life of local people in Thailand. About us, SKY SAMUI TOUR, we are local people in Koh Samui who operate the services of transfer for long long time ago. The services normally between Koh Samui airport and your hotel and vice versa. Also arrange the private car with the driver to visit the beautiful places around Koh Samui Such as Big Buddha Temple, Plai Laem Temple, Lad Koh Viewpoint, Grandfather and Grandmother Rock, Guan Yu Shrine, Mummified Monk at Kunaram Temple, Namuang Watearfall No.1, Nathon Town. Our Service is also can arrange another activities to another islands nearby Such as Koh Phangan, Angthong National Marine Park , Koh Tao and Koh Nangyuan, Koh Taen (Coral Island) All service bookings you can choose to pay us by PayPal in advance or just book online, get confirmation by email, and then pay on the service day in cash to us. Everybody in our team is ready for serving you now. Please read more information and thank you very to visit our web site. We hope to see you soon in Koh Samui. Have a good day !!! When you stay in Koh Sami, you can do many activities, such as sightseeing, Hiking, Relaxing on the beach, kayaking or snorkeling at nearby islands like Koh Taen (Coral Island, Angthong National Marine Park, Koh Tao and Koh Nangyuan. Snorkeling trip we have to go to Koh Taen The (Coral Island), Angthong National Marine Park and Koh Tao Koh Nangyuan Trip by Speedboat. Sightseeing you can do the trip inside Koh Samui and nearby islands. The sightseeing trips of the other islands actually will combine with snorkeling activity. Koh Samui has many temples, most are very beautiful. The most famous one is The Big Buddha Temple, and another beautiful one is Plailaem Temple. We recommend to do Sunset Snorkeling Trip to the coral Island, or just rent our car with the driver to visit the beautiful places inside Koh Samui for half day in the afternoon. If you love to see some animals, do not miss the Elephant Sanctuary in Koh Samui, or another elephant camp you can do the Elephant Trekking Trip. Sometimes people said all trip were too long time. But we also have the very short time trip like Mini Adventure Tour, Elephant Trekking 30 Minutes, Sunset Dinner Cruise. Some days in rainy season Koh Samui has a lot of rain. And the people do not know what activities that they can do. This is some activities that you can do on the rainy day in Koh Samui. As we are local people in Koh Samui, we have knowledge to choose the best thing for your holidays and much more options of activities to do during your holidays time in Koh Samui. We don't add hidden extras cost. All trips include travel permit, lodging and fooding. There are no surprises with hidden costs. If anything not included in package we will inform on that tour page. All customers can choose that they will by immediately by credit card via Paypal or pay on the day of the transfer or trip to us in cash. In case of trip cancellation of bad weather, full refund will return to you in cash to your hotel within the next day after the service day. Learn to know the life of people in Koh Samui with our private car, van, jeep with our drivers.